Take a South Coast Tour of the Shoalhaven region on the NSW South Coast with the peak tourism operators. We have collaborated with industry leaders to deliver the very best travel experiences for you. We travel with Kennedy’s Tours, stay at South Coast Retreat, play at Shoalhaven Zoo and cruise with Jervis Bay Wild. Your South Coast Tour begins with expert knowledge and friendly service the moment you step aboard your Kennedy’s Coach. While journeying to South Coast Retreat you will benefit from informative commentary. Your friendly, expert guide will help you with any questions you may have, and of course will be ready to take some great pictures of you on your South Coast Tour. Our South Coast Spectacular 3 day itinerary includes the best places to visit and things to do on the South Coast. We stay in the region’s best waterfront accommodation. We use the best guides and we travel with the regions best tour and transport company making sure that you have an unforgettable, spectacular tour of the South Coast. Over 3 days you will have the opportunity to wander though a rainforest, cuddle a koala and a kangaroo, sample some oysters, indulge in some local food and wine, go shopping in a couple of country villages, cruise the river as well as Jervis Bay, go for a paddle on a kayak, wander along some beaches and through some bush while staying in 4 star waterfront accommodation at South Coast Retreat, Greenwell Point. If departing from Sydney, we visit The Royal National Park, Bald Hill Lookout, The Grand Pacific Drive and Sea Cliff Bridge, the beautiful Budderoo National Park and Minamurra Falls Rainforest and Kiama Blowhole. A delightful sunset cruise along the Shoalhaven River will bring you to your waterfront accommodation at South Coast Retreat. 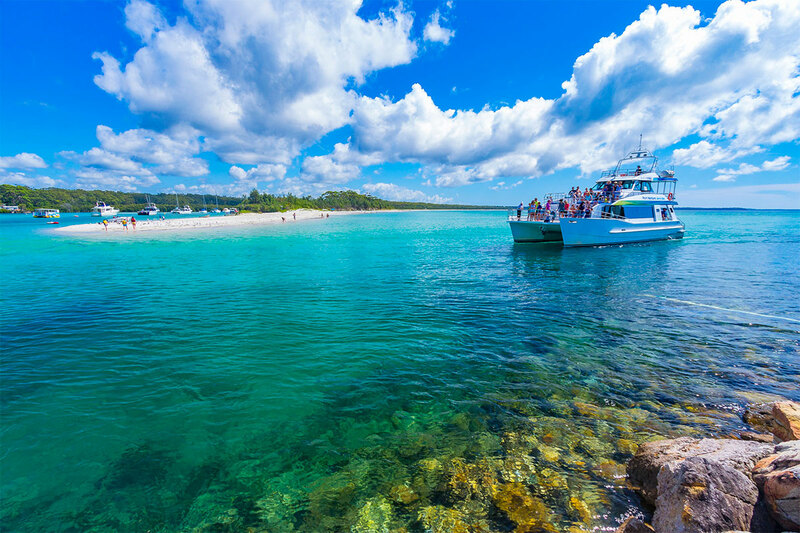 After a leisurely breakfast and perhaps a walk along the waterfront we travel to Jervis Bay where you can either visit the Jervis Bay Maritime Museum or hop on board a cruise with Jervis Bay Wild. Lunch is delicious fish and chips overlooking the bay at the Club Jervis Bay. We then move on to explore the ecology, culture, history and whitest sands of Jervis Bay’s beaches and Booderee National Park. Saving the best till last we spend our final morning at the Shoalhaven Zoo where you will get to cuddle a Koala and a Kangaroo and a Dingo and any other animal that’s on show as well as the historic Meroogal House. Next we will travel to the township of Berry, the first truly rural town south of Sydney. With its historic buildings and leafy surrounds, Berry is a delightful village to visit year-round. In the past few years Berry has become a favourite refuge for Sydneysiders seeking fresher air and a less hectic lifestyle who don’t want to forego some of the attractions of city living. The town is well supplied with all the essential ingredients of an urban lifestyle, including many arts, crafts and design outlets and restaurants & cafés and gourmet outlets. Contact us for more information regarding other departure points such as Canberra and the Southern Highlands.